The Fiji Roads Authority (FRA) is beginning construction of a new roundabout to be trialled at the intersection of Waimanu Road and Brown Street. FRA General Manager Network Operations and Maintenance Aram Goes says the roadwork is expected to commence on Monday (15th May) after 8pm and be completed by Wednesday (18th May), subject to weather, during which the Waimanu Road access will be restricted to a single lane during nighttime site works. “The new roundabout trial and lane markings is aimed to help drivers have better guidance and safety through this busy road intersection and also encourage drivers to reduce their speed whilst travelling in and around the area,” Mr Goes said. 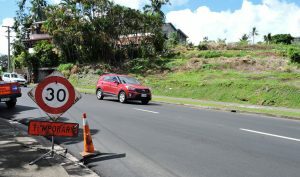 He said these continued Waimanu Road surface improvement works would be mostly undertaken at night to make sure that there was little disturbance to peak-time traffic. “Access for members of the public will be maintained at all times and the FRA wishes to thank the travelers, residents and businesses along the area for their patience during these important works”. Mr Goes has urged motorists to drive with care, respect the speed limit and observe all road signs. This project is part of the Waimanu Road Accelerated Structures Repair (ASR) Program, which will mitigate the poor road condition to improve safety and accessibility on this busy transport corridor into the City. Furthermore, the ASR Program of road surface improvement works for Princes Road, Dilkusha and Kings Road, Wainibuku have been successfully completed, contributing to reduced journey times for road users through these major routes. Meanwhile, the complete rehabilitation of the entire Waimanu Road is scheduled for 2018. This will include replacing and realigning of aging, deteriorated underground water supply infrastructure within the carriageway. This planned 2018 work is made possible by funding support from the Asian Development Bank, further contributing to the FRA’s continued efforts to restore Fiji’s ageing land transport network.